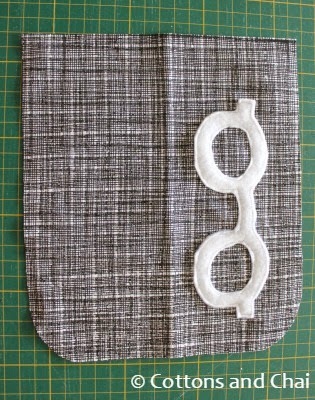 Cottons & Chai: Spectacles Case - Rest those tired eyeglasses! 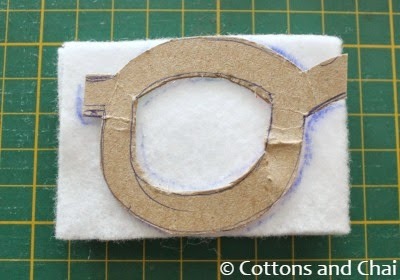 3) One piece of medium weight batting 8.5" * 7.5"
4) One piece of coordinating felt 6" * 2"
First I started by drawing a glasses shaped pattern on a piece of card paper 6" * 2". 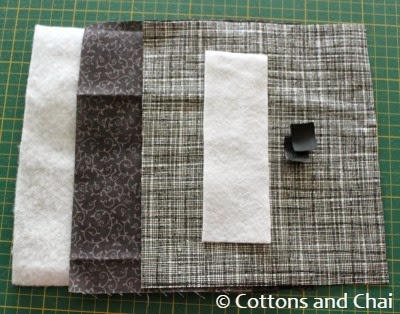 Then I folded the felt in half along the long edge, traced the pattern and cut it out. Next I placed the batting and two cotton piece on top of each other (the order does not matter at this point). 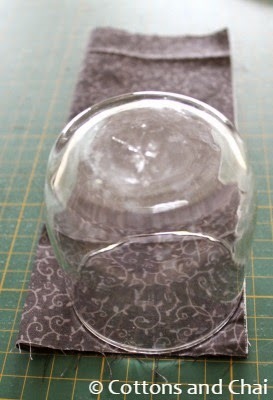 I folded the sandwich in half along the short edge and used a small glass to mark a curve on the corners and cut it out. Then I placed the batting on work surface and put the lining fabric on it right side up. I stitched the velcro pieces an inch from the top and an inch and half from the center on either side. Next I placed the prepared lining on work surface right side up and put the appliqued outer fabric over it wrong side up and pinned them together. 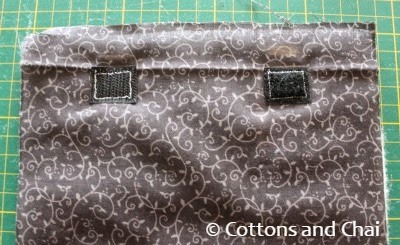 The next step is to sew the two together along the curve. Usually I eyeball (haha) these things, but this needs to be done as evenly along the curve as possible, so using a ruler I marked 3 lines 1/4" from the edge on all 3 lower sides. Now it was easy to just join up the curves at the 2 intersections. 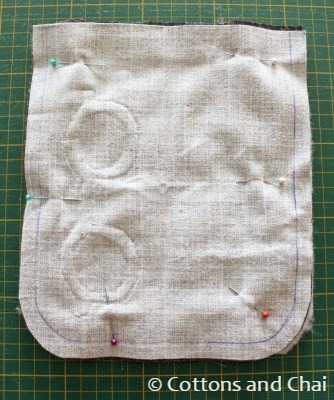 I sewed along the marked outline leaving a 3 inch gap at the top, clipped corners and cut notches along the curves. 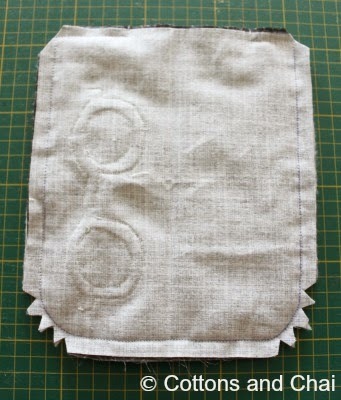 Then turned the case inside out, turned the upper open edges inward, pressed the case flat and top stitched along the upper edge to close the gap. Then I just folded the case in half, joined up the two curves nicely and sewed close to the outer edge to complete the glasses case! A pair of glasses can sit nice and snug inside the soft case while the little velcro at the top prevents them from accidentally slipping out! 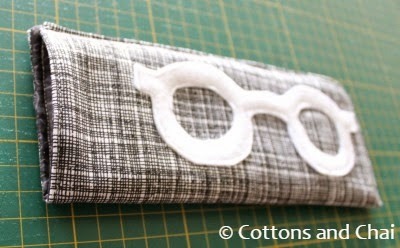 And so on with the rest of the fabric I chose to make this bunch of glasses cases ready for the quilt guild. I do hope they catch someone's eye at the festival! They surely will! 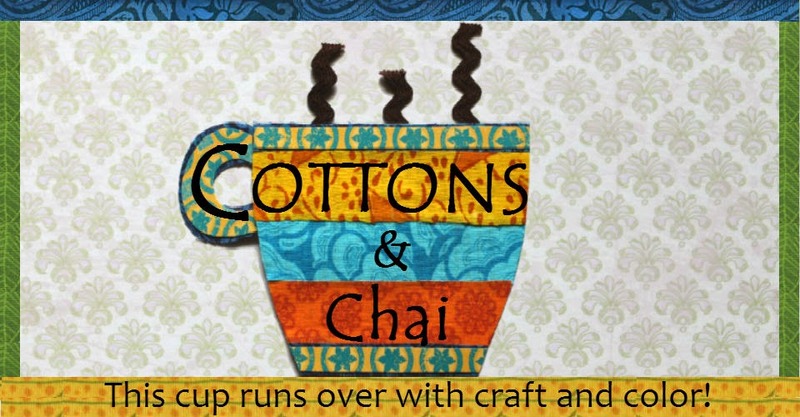 Loved the applique work and newspaper inspired black n white color scheme. Good luck for the stall, I wish I could attend this show.